Illstreet defines Indexer Performance as the number of table index's per minute with respect to the life (B10 torque capacity on the indexer). Indexer performance was determined from 50 to 300 index's/min. Indexer performance was based on the B10 Torque Capacity allowable. While each individual Indexer manufacturer has there own Torque Capacity requirements, Illstreet provides a generic B10 Torque Capacity covering a range from 5,000 in.lb to 20,000 in.lb. This B10 torque capacity was at indexer performance of 50 index's/min. To ensure no operational problems arise from the indexer, it is normal custom and practice to reduce the B10 Torque Capacity to 50% of the indexer's manufacturers value. To account for reduction in B10 Torque capacity at higher index rate performance levels and not violate proprietary indexer manufacturers B10 life estimations a simple linear relationship was assumed by Illstreet. Illstreet linear B10 Torque Capacity requirements for index rates higher than 50 index's/min. The B10 Torque Capacity is a indication of indexer life in hours. The number of hours is proprietary to the indexer manufacturer. A single rotation of the Camshaft completes a index and dwell. 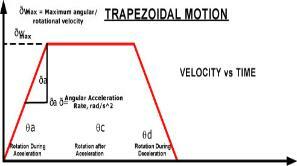 A simple trapezoidal motion was assumed for the performance analysis, 1/3 acceleration, 1/3 constant velocity and 1/3 deceleration. 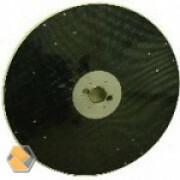 The indexer performance was estimated for a 24", 36" and 72" diameter 1" thick aluminum dial table and compared with the performance of a CFCD-001-1000A-R02 (1.152") carbon fiber disc. Using the B10 Torque Capacity as a Indexer Performance allowable, the Indexer's performance ceiling can be obtained with respect to the number of index's per minute. The maximum number of index's-parts per minute possible from a 24" diameter Aluminum Dial table was about 200. The maximum number of index's-parts possible from a 24" diameter Carbon Dial Table was 258. The maximum number of index's-parts per minute possible from a 36" diameter Aluminum Dial table was about 175. The maximum number of index's-parts possible from a 36" diameter Carbon Dial Table was 275. The maximum number of index's-parts per minute possible from a 72" diameter Aluminum Dial table was about 145. The maximum number of index's-parts possible from a 72" diameter Carbon Dial Table was 260.